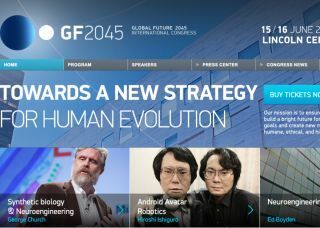 Discussions at the GLOBAL FUTURE 2045 CONFERENCE at the Lincoln Center in New York in June (2013) included such topics as “On The Path to A New Evolutionary Strategy” (discussing how humans can get their minds to outlive their bodies) and “The Future Life Supported by Robotic Avatars” (discussing the creation of ‘seamless, humanoid robots’). The primary aim of the conference was to bring the top minds of medicine, science and technology together in one location to discuss the technologies that will enable biotechnology to merge in such a way with the human experience as to make immortality viable. What’s next? “Man-God: The Making of God in Man’s Image” … ? This entry was posted in End-time Bible prophecy and tagged evolution, immortality. Bookmark the permalink.